This was supposed to be my submission for the Daring Cooks in October. 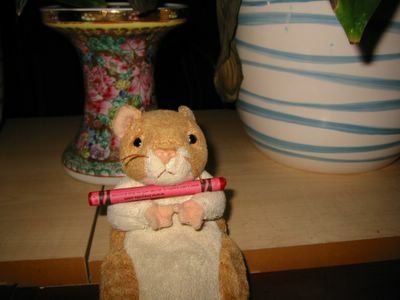 But for some reason I wasn't able to blog. So here it is and what a very good recipe to keep. 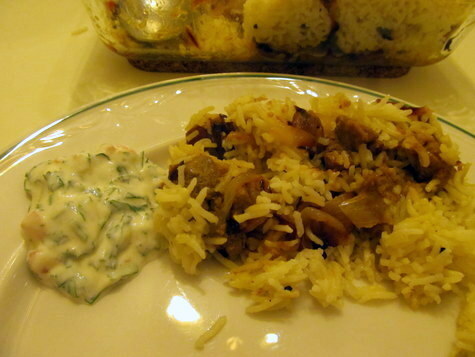 Actually, I made a lamb biryani earlier using a recipe from another book. You could probably hear the crash it made when I tossed it in the rubbish bin. The dish that came out of that was vile! And the meat was so tough I wasn't able to eat it. Well I say good riddance. One less cookbook on my bookshelf. My ever reliable cookbook by Angela Nielsen, The Ultimate Recipe Book, was the source that I adapted for this keeper of a recipe. The accompanying tomato raita paired very well with it. My only gripe was that it took quite sometime to make and involved a lot of steps and ingredients. But it is perfect for those infrequent special occasions where your effort will be well rewarded with one delicious complete meal. Marinate the meat - combine the yoghurt, garlic, ginger, cinnamon, turmeric, and salt in a bowl. Mix in the lamb and marinate for 2-3 hours or more. Dissolve the saffron in the lukewarm milk. Set aside. Combine the melted butter and garam masala. Set aside. Once the lamb has marinated, saute one of the sliced onions in 1 1/2 Tbsp oil in a saute pan. Fry over medium-low heat until it has softened (about 5 minutes). Add the marinated lamb (including the marinade) a tablespoon at a time, cooking and frying briefly before adding the next one. This helps stop the yoghurt from curdling. When all the lamb has been added, cook for about 10 minutes. Add the chilli powder and/or fresh chillies (if using) and fry for a few seconds. Mix in the hot water. Bring to boil and then turn the heat to low and simmer covered for about 1 hour or until meat is very tender. Stir from time to time. Put the rice in a bowl cover with cold water and soak for about 20 minutes. Drain. Set aside. While the rice is soaking and the meat is cooking, cook the rest of the onions in a large saute pan with about 2 Tbsp oil on medium heat. Sprinkle salt on it to stop it from burning. Fry for about 25 minutes or until golden brown all over. Tip the onions onto kitchen paper towels, spread them out in thin layer and set aside to cool. 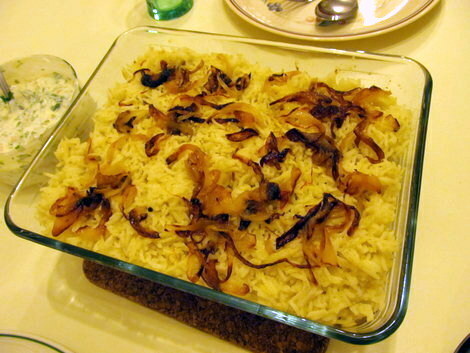 To cook the rice - heat the remaining 1 1/2 Tbsp oil in the pan used for the onion. Fry the cinnamon sticks, cardamom, cloves and cumin seeds for about a minute or until you could smell the aroma. Add the drained rice and fry for a minute, stirring all the time. Add in the stock and bring to boil. Cover and cook over medium heat for about 6-7 minutes or until the all the stock has been absorbed. Take off the heat, let stand but keep the cover on. Heat the oven to 180°C/fan 160°C/350°F. Butter a 2.5 litre casserole dish or pot. Fluff the rice with a fork while picking out the spices from it. Spread in half of the lamb at the bottom of the casserole. Scatter a third of the fried onions on top. Spoon half of the rice on top of the lamb and onions, then pour the spiced butter all over. Repeat the layers and finish with a sprinkling of the spiced milk on the rice, then the rest of the fried onions and toasted nuts. Cover tightly with foil then put the casserole cover on and bake in oven for about 20 minutes. Sprinkle with mint (if using) and coriander. 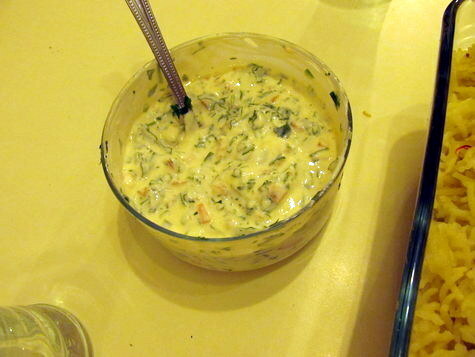 Serve with coriander and tomato raita (see below). If using cumin seeds, briefly dry-fry the seeds in a small pan until toasty and aromatic. Grind to a powder. Combine cumin powder and all the other ingredients in a bowl. Celia, We would like to add your blog to the Top Food Blog list in http://www.mytaste.ph/ . Your blog is impressively BEAUTIFUL and it deserves to be included on the Top Blog list!! Great recipes!! We will feature your blog so that people and our 3million users worldwide will see it on our site and we will make a lot of shout out about your recipes on our fanpages. If you would like to join, here is the link http://www.mytaste.ph/join_top_food_blogs .